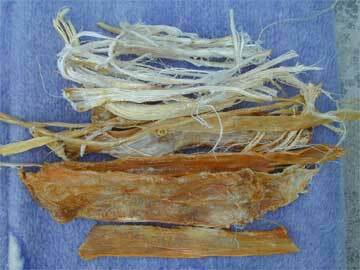 Sinew, the shredded fibers of animal tendon, was used for cordage, binding points on arrow shafts, and for backing material for bows. Why sinew? What are its properties which make it so desirable for these uses? Obviously it is tough and it shrinks when it dries, but how much? A fairly extensive search of the Stanford library, asking professors of biomechanics, mechanical engineering, and archeology yielded no useful information. It looked like I would have to get my hands dirty and do some experiments on the stuff but first, what did we already know about sinew? Saxton Pope, a professor of Medicine at the University of California in the first part of this century, an intimate of Ishi's, and an ardent bowman, wrote a delightful little book about Indian bows and arrows titled "Bows and Arrows". He stated that when Ishi made sinew-backed bows he did not worry much about cutting through the heartwood on the back of the bow. This was in contrast to all of the old-time books which describe the fabrication of longbows out of yew, osage orange, or any of the other classic bowyer's woods. The standard caveat when building a self bow (wood only) was to be very careful about having the back of the bow (the part away from the archer) follow the grain of the wood exactly or else it would break where you cut through the wood fibers. Pope also did experiments with miniature yew bows backed with rawhide or catgut. His conclusion was that adding the backing made very little increase in the cast or ability of the bow to shoot a long distance. Therefore, he concluded, the presence of the backing only protected the back where the grain wasn't parallel and prevented the bow from breaking at full draw. Pope is to be commended for doing experiments but more needs to be done to understand what sinew does. The Eskimos also made sinew-backed bows but in their frigid and damp climate it was impossible to do anything with glue, so their sinew was applied in the form of twisted cordage tied on the back of the bow. The tension in the backing material was increased by twisting after it was bound to the back of the bow (see Callahan, Bulletin of Primitive Technology #1 & 2). Reginald Laubin, in his book "American Indian Archery", described his experiences in replicating Indian bows from osage orange wood and sinew. He stated that as the sinew backing dried it tended to shrink and pull the bow into a deeper and deeper recurved position and contrary to the claims of Saxton Pope, it made the bow more powerful. Laubin's book is full of practical experience but nothing very quantitative. Another article in "Scientific American" magazine on crossbows (January, 1985) stated that sinew has a tensile strength of 28,000 pounds per square inch. This is useful information but it is only 1/3 of what is needed to characterize sinew. My own experience with the construction of sinew-backed bows started when I saw a backed bow made by a man living in Oakland. A beautiful job. The replies to my questions were that it was deer sinew applied with Elmer's Glue. Did it shoot well? I didn't ask. Several years later I made a short flat bow out of Santa Lucia fir (initially misidentified as California nutmeg), backed it with horse sinew applied with Elmer's carpenter's glue. It was a lesson in the fact that even a knotty, poor piece of wood will make an acceptable bow when backed with enough sinew. My next attempt was a very close replica of a 36 inch Yurok bow in the Wattis Hall of Man, Golden Gate Park, San Francisco. This was a yew wood plus sinew combination with very wide thin limbs. Some very elementary mechanical engineering theory says that the only way you can make an extremely short bow such as this and still shoot a reasonable length arrow is to make the limbs wide and thin. Again I glued the horse sinew on the back with Elmer's carpenter's glue. What a disappointment! It looked very nice but didn't shoot worth a darn. After shooting awhile and then unstringing the bow, I noticed that the bow followed the string (bent towards the archer) but after being unstrung a few hours it went back to its original shape. In general the bow was "flabby". My last experiment was a plains Indian style bow, made from a 48 inch black locust stave. 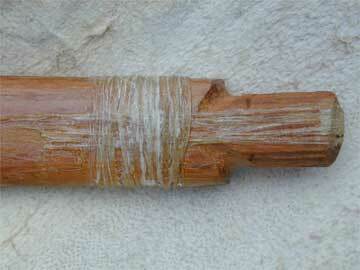 This time I used hide glue to bond the horse sinew to the back. This bow was dynamite, powerful and fast. Did the hide glue make that much difference? Potential energy: the ability to do work. When you pull the bowstring back you store potential energy in the bow limbs. The available potential energy is equal to the distance you pull the string back multiplied by the average force that it took to pull the string back to full draw. When you release the string the potential energy is transferred to the arrow, giving it . . . Kinetic energy: the energy of motion. A perfectly efficient bow would transfer all of the available potential energy stored in the bow limbs into kinetic energy of the arrow. Elastic modulus: a measure of how stiff a material is. Make a one inch cube out of the material and stretch it with a known force. The cube will get slightly longer. The elastic modulus is the force times the length of the block, divided by the area of the block times the distance the block stretched. Steel has an elastic modulus of 30 million psi (pounds per square inch), hickory has an elastic modulus of 2.2 million psi, black locust has 2.1 million psi, and the measurements I have made on yew wood give a figure of 1.2 million psi. Tensile strength: keep pulling on that one inch cube of material and eventually you will pull it apart. The force per square inch that it takes to pull something apart is the tensile strength. For tempered steel the number is 400,000 psi, for hickory it is 20,000 psi. For those of you who wonder: yes, it is very impractical to make these measurements on a one inch cube of material. The one inch cube was cited to emphasize the force per unit area nature of the experiment. In actual practice a much skinnier specimen of the material would be tested. My measurement of the elastic modulus of a dried, solid horse tendon gave a figure of 411,000 psi. Similar measurements on yew wood yielded 1.16 million psi. This said, much to my surprise, that under the best of circumstances sinew had only 21 to 35 percent of the elastic modulus of wood. Put in other words, and leaving out the mathematical formulas, if you make a yew wood bow of 50 pounds pull and add more yew wood on the back to make the limbs 5 percent thicker, the resultant bow will have a 15 percent stronger pull or 57.5 pounds. If, instead of adding more wood on the back of the bow, you make the bow limb 5 percent thicker by adding sinew, the increase in draw with would only be 2.2 percent or an additional 1.8 pounds. Why bother adding a material to the back of the bow which doesn't add much to its strength? The other 'secret' ingredient must be shrinkage. I was pretty well convinced that sinew shrank while it dried and this put the sinew backing under great tension. Did the amount of shrinkage depend on the type of glue used? The experiment to find this out was to glue sinew on the backs of two identical strips of 1/8 inch balsa wood. On the first one, the sinew was glued on with hide glue, on the second, the sinew was glued with Elmer's carpenter's glue. The two samples behaved identically. As the sinew dried and shrank it pulled the wood into a curved shape. This experiment showed little difference between the two types of glue, only that the sinew shrank as it dried. Again I took two identical 1/8 inch strips of balsa wood and put a thick strip of hide glue on one and a similar strip of Elmer's on the other (no sinew on either). This time there was a pronounced difference between the two. The hide glue shrank and curved the wood just as much as the sinew, and the Elmer's glue did not shrink at all. Moral of the story: don't use anything but hide glue for applying the sinew. 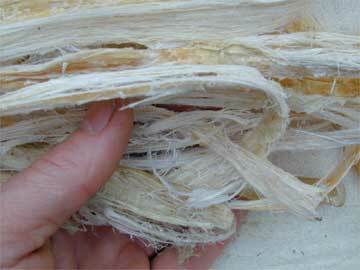 Furthermore hide glue is 'compatible' with sinew since on a molecular level they are identical. The last experiment with sinew was to see exactly how much it shrank when it dried. I pinned one end of a strip of wet sinew to a piece of plywood, and pinned the other end to the short end of a stick that pivoted at one end. Now, when the sinew shrank, the long end of the lever would move through a greater distance and make the shrinkage easier to see. The result was that the sinew shrank 3 percent upon drying. 1. As the sinew dries and shrinks it puts the back of the bow under compression. 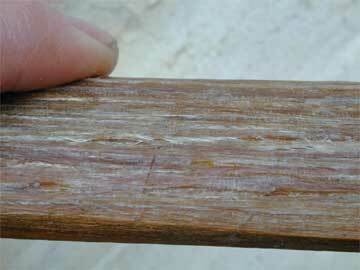 As a consequence, the wood fibers on the back of the bow are not stressed as highly when the bow is drawn. 2. The sinew protects the back of the bow where it doesn't follow the grain. 3. The back of the bow, which is stretched a great deal at full draw, is now a material which can stretch 5 percent before breaking (wood can only stretch about 1 percent before breaking).